According to data collected by the New Mexico Motorcyclists Rights Organization (NMMRO), motorcyclists in New Mexico have been increasingly experiencing profiling stops at the hands of the Bernalillo County Sheriff’s Department. But instead of merely collecting data, the NMMRO recently confronted Sheriff Manuel Gonzales requesting that all department policies and procedures be reviewed, and that all deputies be properly trained and educated so that they understand that profiling and selective enforcement of the law are simply unacceptable. Motorcycle profiling deprives individuals of basic constitutional guarantees and should therefore be a concern to all Americans. The 1st Amendment irrefutably protects the rights of association and expression and judicial precedent has specifically applied these rights in the context of motorcycle clubs, including clubs that law enforcement labels a gang. Being in a motorcycle club is not justification for a traffic stop. And even when a traffic pretext is provided in an attempt to justify the stop, the 14th Amendment prohibits selective enforcement of the law. The Motorcycle Profiling Project (MPP) commends the NMMRO’s proactive grassroots efforts. 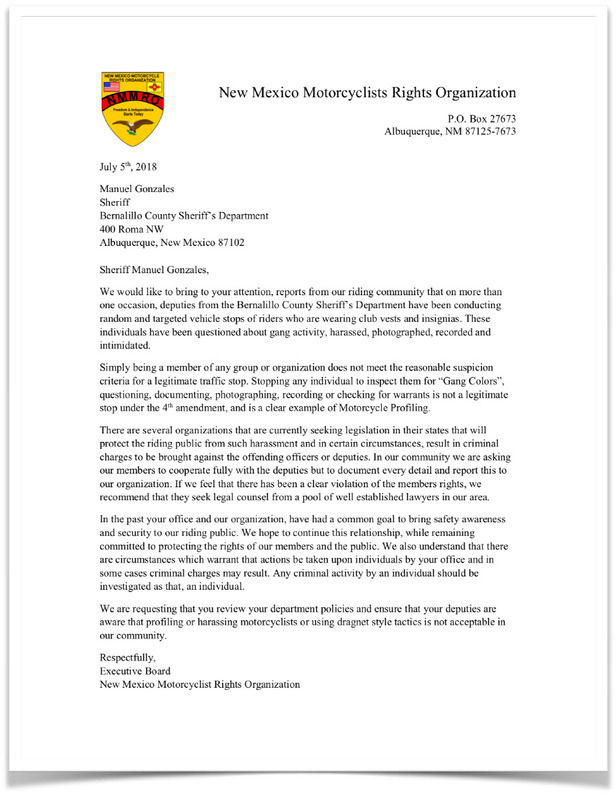 The MPP joins the NMMRO in the request to the Bernalillo Sheriff’s Department to properly educate and train deputies to cease the common practice of motorcycle profiling. Furthermore, the MPP believes that the Bernalillo Sheriff’s department should confirm a commitment in a public statement condemning the practice. Finally, please take the time to fill out the National Motorcycle Profiling Survey 2018 (http:// www.motorcycleprofilingproject.com/national-motorcycle-profling-survey/) and assist the MPP and motorcycle rights organizations nationwide in the effort to end motorcycle profiling and discrimination. The post New Mexico Motorcyclists Confront Sheriff Over Motorcycle Profiling appeared first on Motorcycle Profiling Project. This entry was posted in Motorcycle Profiling Project on August 14, 2018 by Webmaster.